Sure thing after an introduction like that, a la Jim Morrison, I have very little to say. I could probably tell you about the scent of basil, a universal sign of summer; I could unroll the thread of my thoughts and explain how it is that it's tied to pistachios; I could go on about roasted garlic' newfound kindness, an irrefutable proof of the innate goodness of the universe; or else I could write half a treaty on the color green and the vegan pesto. Or maybe I could accept Jim's invitation and leave to wander around, speaking of emerald dreams, the meaning of life before and after pesto, of black and white movies, the surprise endings or the songs at the end of spring. Instead, don't panic, there will be none of that. 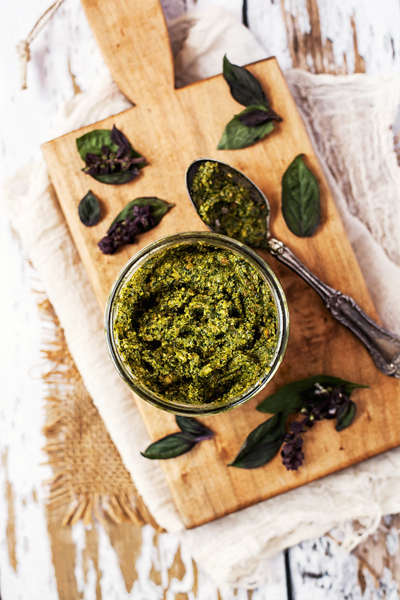 Today I (almost) prefer to be silent and instead entrust my post to Jim's words, my pictures and the green color of this pesto, wishing you a weekend a little rock and a little roll. I, for my part, will go out for a walk down to Costa Rica, to regain my green and the energy I've lost along the way. May pesto be with you until I get back. If I come back. First roast the garlic cloves: put them in a pan, unpeeled, toss with a tablespoon of olive oil, salt and pepper and bake at 360 for about 40 minutes, until they are softened. (Now, I admit that the above process seems too much for six miserable cloves of garlic, so I suggest two alternatives: either you double, what am I saying?, triple the amount of pesto, or, as in my case, you roast a huge amount of garlic cloves, because I swear they're delicious, spread on bread they're a real pleasure, and if you don't make them in abundance you'll regret it, be warned...). 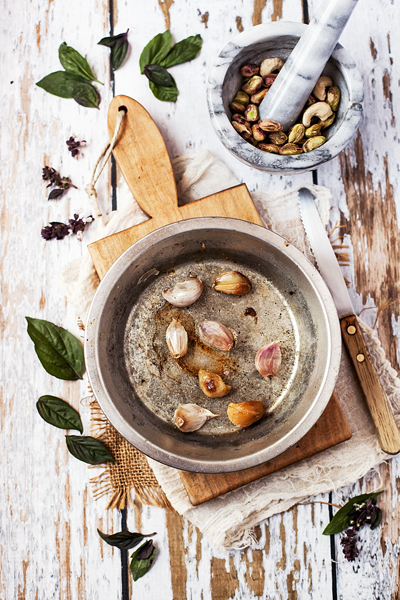 Put in a blender (or in a mortar, for traditionalists) pistachios, cashews and garlic cloves, roasted and peeled. Blend until you get a rather fine grain. Add abundant basil leaves, lemon juice, salt and pepper and blend again. At the end add the oil a little at a time until you get a creamy pesto and fairly fluid. Place in the jars, cover with more oil and store in the fridge. 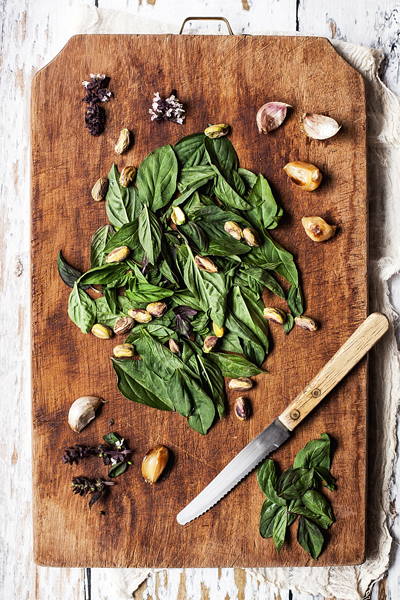 To those who ask me what about Parmesan cheese?, I'd say that Parmesan in pesto is just a modern fantasy; you can do very well without it, and in any case, to avoid any doubt, I added if you notice a handful of cashews, which will give your pesto just the right touch of parmesanosity creaminess.